A demonstration in Paris in support of Palestinians has resulted in several injuries and at least 38 arrests as activists clashed with riot police who used tear gas to disperse an unsanctioned rally that gathered despite a government ban on such rallies. 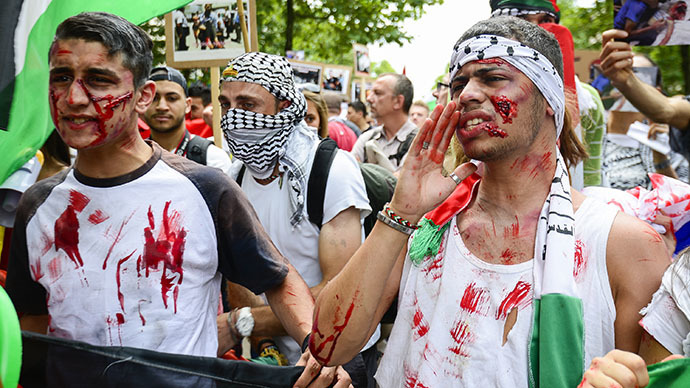 Demonstration in Paris against the Israeli military operation in Gaza strip, which recently escalated into a ground invasion, took place despite Friday's municipal government ban. 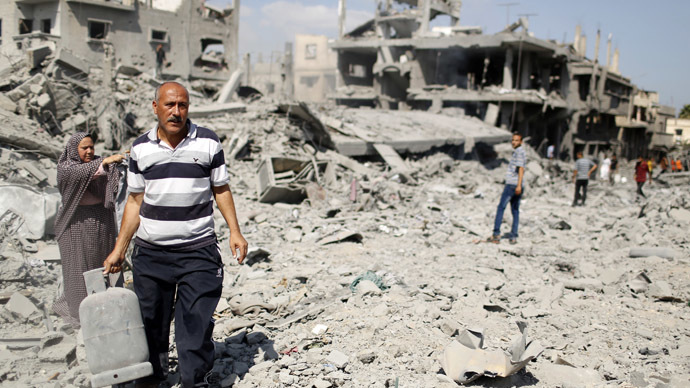 Operation Edge in the twelfth day of the Israeli offensive on Gaza has so far claimed the lives of 342 Palestinians, with at least 46 people killed on Saturday alone. Organizers estimate that up to 10,000 people attended the rally organised by the New Anti-Capitalist Party (NPA), among others. The protesters gathered in Barbes, in the Montmartre area and Opera Square. Several Israeli flags were publically torn and burnt to the cheers of the crowd at the beginning of the rally. The protest eventually turned violent with dozens of protesters, using stones and bottles, to attack the police lines for several hours in a northern district of the capital, according to AFP reporters. The police responded with tear gas. In the late afternoon, a dozen of young men, some carrying the Palestinian flag on their shoulders, were still pelting police with stones. By nightfall, boulevards around the neighborhood of Barbès were covered with broken glass, wrecked telephone booths, and two vandalized public buses. According to police sources, 38 people were arrested during the clashes, AFP reports, adding that 14 policemen were also wounded. The number of injured among the protestors is still unknown. 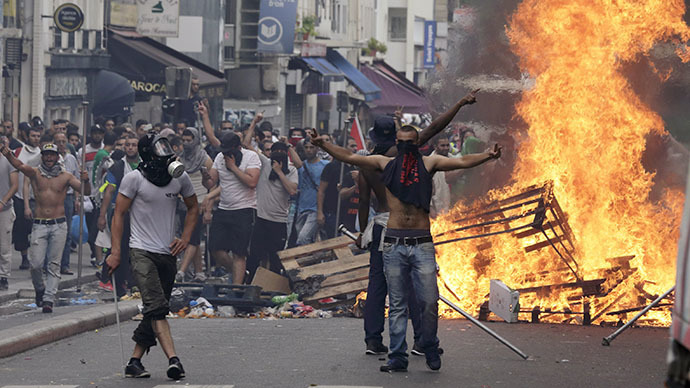 French president Francois Hollande said he would not allow Israeli-related violence to spill over into France. Rallies were also held in most major French cities. 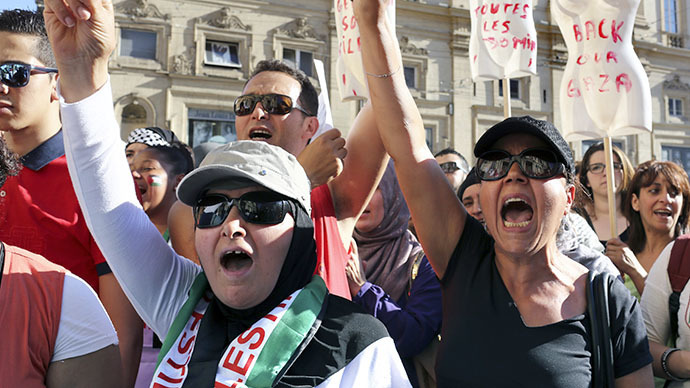 Up to 4,000 people rallied in Lyon, with 3000 joining the anti-Israeli rallies in Marseille and at least 1,300 in Strasbourg. Independent journalist Robert Harneis told RT that the French Interior Ministry had used the tactic of banning public displays of anti-Israeli sentiment before on the basis it is a threat to public order. 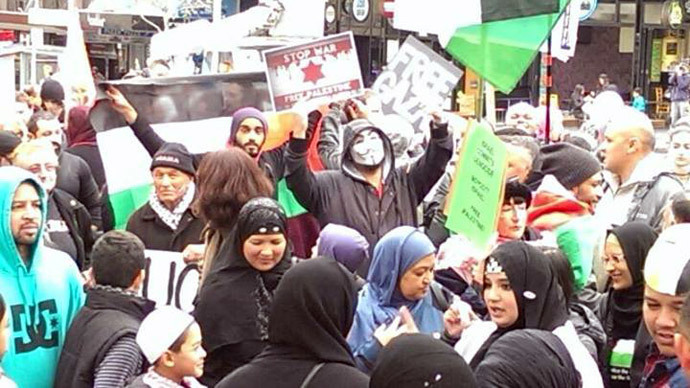 Elsewhere in Europe, including London and Brussels, thousands of people also marched and called for an end to Israeli incursions and the lifting of the blockade on Gaza.